Have you heard any of these? Admire any of the attitudes? It’s easy to get sucked along in the same-old, same-old grind. Then get grouchy about it. It can be easy to envy people for their perceived way of life. Some people seem to get all the breaks. It is too easy to take our daily life for granted. I want to be a grateful person. I go to church NOT because I consider myself a stellar Christian, but because I need the reminder of how I should be living. Attending can help me find the quiet place inside me to reflect on the blessings of my life. I want to remember how lucky I am to have a good place to work. I started my job at Shelby Electric seven months after Gary died. It was one of the first defining moments where I knew the boys and I were going to be okay. I could do this; I could support our family. Luckily for me, I even enjoy the work I do! Not everyone has that. Luckily for me, I work close to home. Many people, my husband included, have long commutes to and from their offices. Good health, physical and mental, is a blessing. So, I shouldn’t grumble about the ability I have to exercise. People in wheel chairs might love being able to get on that treadmill. I am fortunate I am capable of lifting 5-gallon buckets of feed during chores. I want to always be thankful for our home in the country…with all it’s work, expenses, quirks and faults that make it our home. 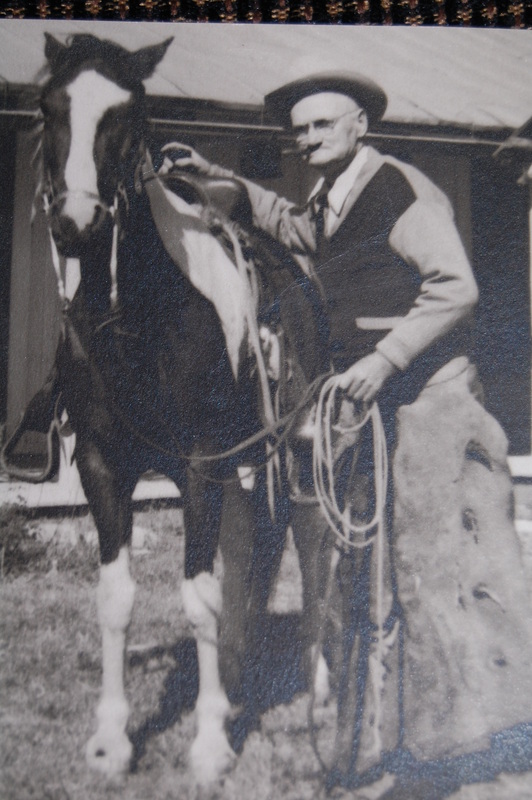 When I was thinking about this blog idea, I remembered a picture I have of my Great-Grandpa. Where did I put it?? I started searching. Found it! Just as I remembered it. He looked like a gritty ol’ cowboy standing next to a beautiful horse. A horse that looks like the one I wanted when I was a young girl. The back of the picture says it was taken in 1950 in Texas. It looks older than that. It’s my hand-writing on the back, yet I do not remember who told me the details. He looks tough. He looks like a character. I wish I would have known him. I can also see my Grandpa in him. Maybe there’s a little of him in me. I sure hope so. Someday I will have a special place that I write. My quiet place. This picture will be where I can see it. I think he looks like he would like his coffee hot, strong and black. What do you think? This entry was posted in Country Living, Friends and Family, Random Thoughts and tagged 5 gallon buckets, chores, coffee, cowboy way, Cowboys, exercise, gratefulness, gritty, high horse, tough, true grit, walking. Bookmark the permalink. Beautifully written, Marla! And I’m anxious for my quiet writing place, too … one of these days we’ll have them : ) Thanks for sharing! Thanks, Lisa. Planning a quiet, writing space is half the fun, probably. 😉 But, I like to dream.